The electron source chamber houses the electron gun assembly; essentially a UV lamp irradiates a gold layer on a quartz disk, ejecting photoelectrons which are then accelerated to the desired energy. A gate valve allows isolation between the chambers to ensure that the electron source assembly exposure to air (for example, when the calibration chamber is vented for instrument removal) is minimised to prevent deterioration of the electron gun gold surface, which can lead to reduced performance. 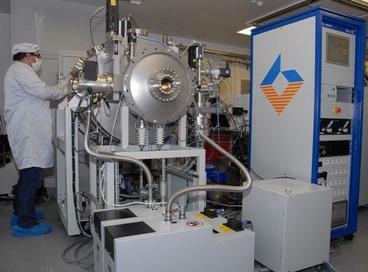 Prior to a calibration campaign, the electron/ion beam is characterised via a raster scan of a channeltron/Faraday cage mounted on X-Y linear drives. The flight hardware is then mounted on a three-axis rotary table, allowing complete 3D manipulation of the instrument within the beam to provide a comprehensive calibration dataset. This system can produce either positive or negative ions in a well focused beam. The ion beam energy can be varied over a wide dynamic range from 1 keV to 30 keV, with energy spreads typically less than 20 eV. Ions produced in the arc discharge Duoplasmatron ion source are extracted from the source anode aperture by the Extraction Gap and then focused to the desired position by the Einzel Lens. The variable focus lens provides a wide range of beam options. By varying the extraction voltage, the final beam energy can be adjusted over a range of 1 to 30 keV.